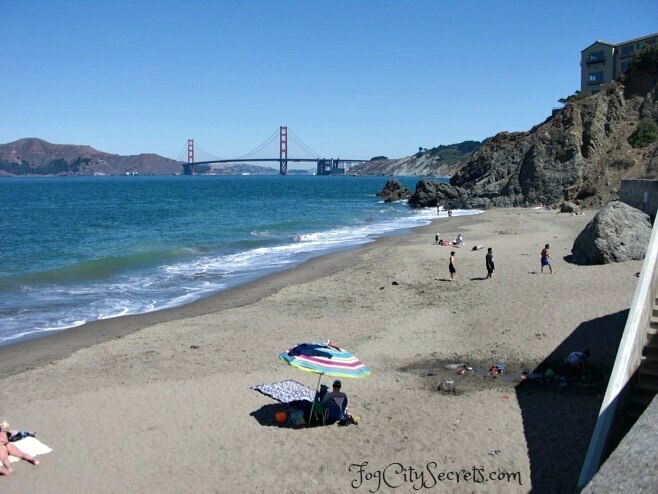 China Beach San Francisco: explore our great little pocket beach! 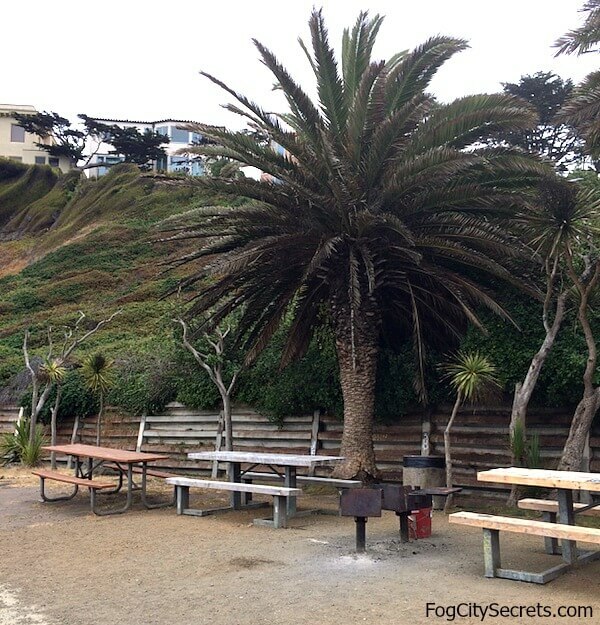 Hidden away in an exclusive San Francisco neighborhood...a charming little beach! 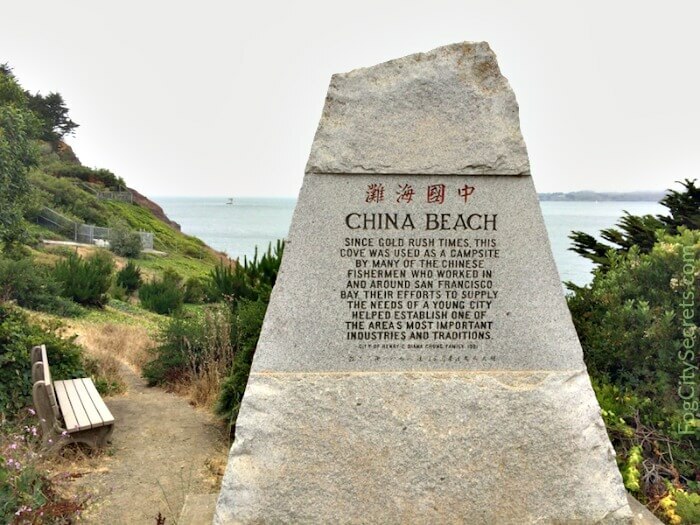 China Beach was named after the Chinese fishermen who used to camp here during the Gold Rush Era. Now it's a pretty beach used for sunbathing and picnics: not so well-known, and therefore not usually crowded. 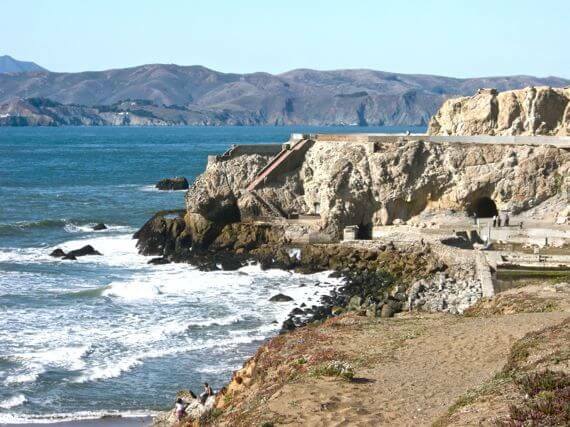 China Beach is behind the Sea Cliff residential area, between Lands End and the more heavily-used Baker Beach. 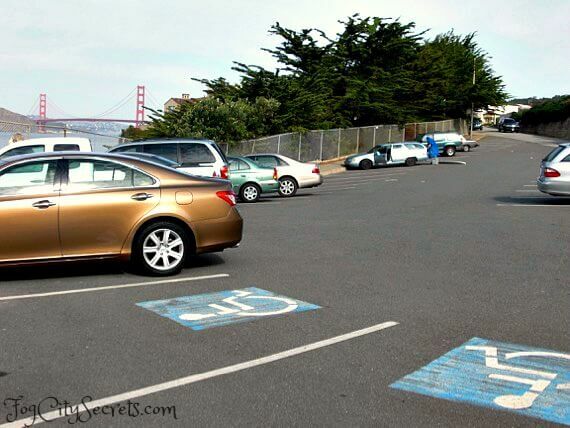 There's a parking lot on the bluff above the beach and a steep stairway going down to the recreation building. From there, another flight of stairs takes you down to the sand. 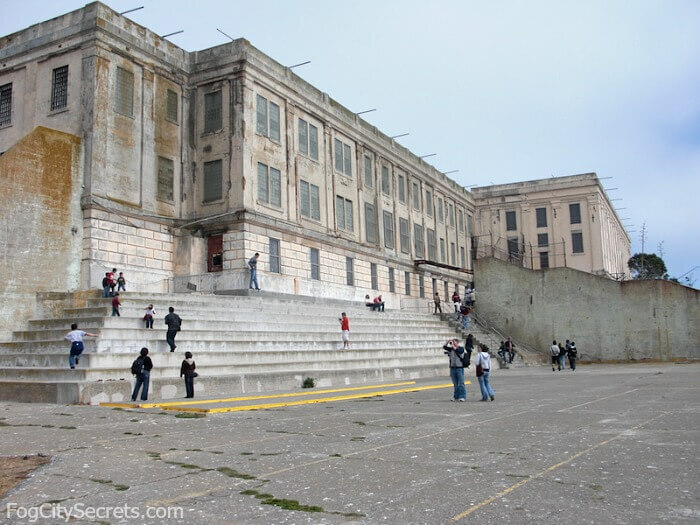 As an alternative, there's also a winding road down to the building, and a paved path down to the beach. The beach and its facilities, including parking, are free. A picnic area with tables and grills is available, first come, first served. There are no food concessions nearby. Nearest snacks are on Geary Blvd, five blocks south. The restrooms and showers are currently closed due to repairs. Porta potties only. Water fountains are off also. No pets, fires (except in BBQ grills provided in picnic area), or glass containers are allowed. Swimming is dangerous because of the strong currents. Parking is pretty easy: a free lot above and some street parking. The roof of the building is a sheltered area for sunbathing on windy days. 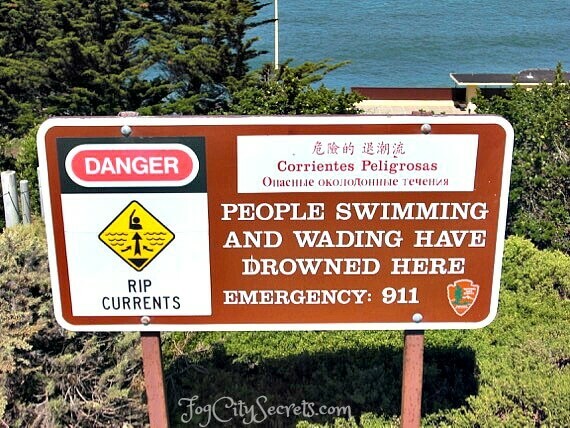 The currents around San Francisco are very dangerous and even though you will see some people swimming at China Beach, I advise against it. Plus, the water is ice cold. 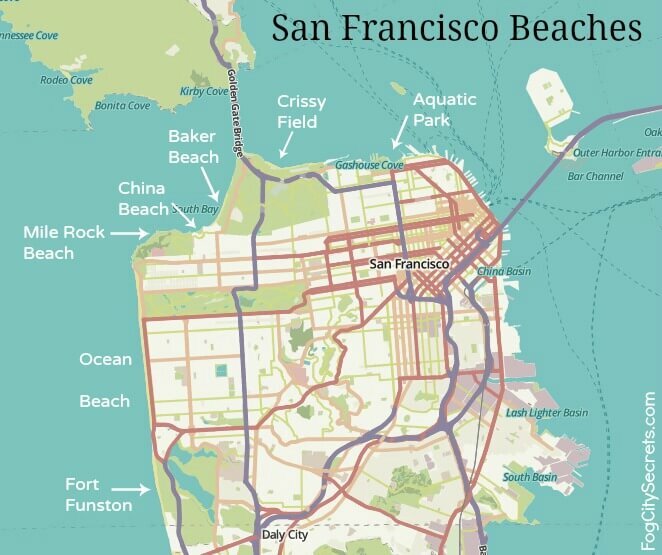 For more info on why it's not a good idea, see my page on San Francisco's rip currents. Have a picnic. There are five picnic tables and two bbq grills for public use next to the recreation building, first-come, first-served. Also, many people like to bring a blanket and have a picnic on the beach. Sunbathing. 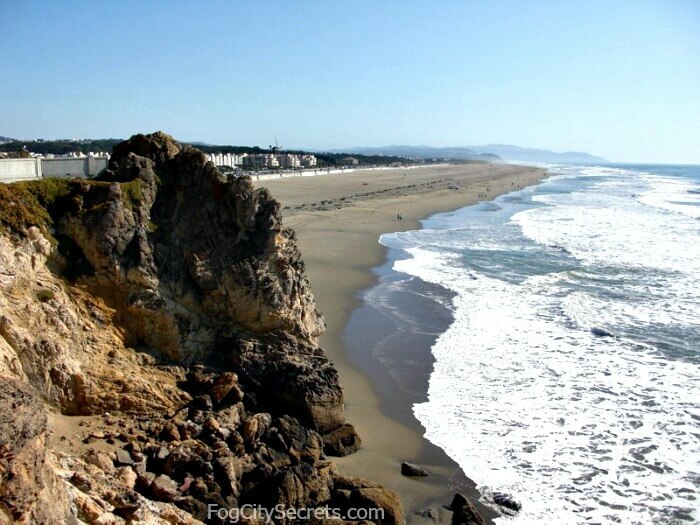 China Beach is popular with sun-bathers (when it's not foggy!). It's surrounded by rock which helps to block the wind. When is it not foggy? April, September, and October (and wintertime). May, June, July, and sometimes August, are the foggy months. 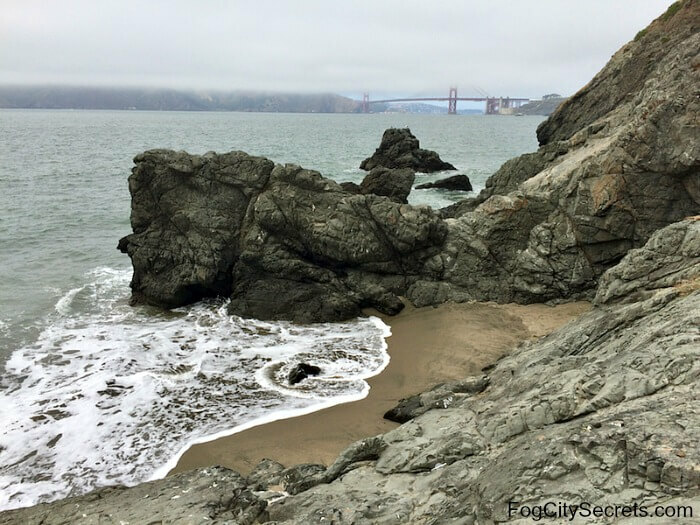 China Beach has a good view of the channel leading into San Francisco Bay, and there's a chance of getting a glimpse of whales (in season), porpoises, and sea lions. 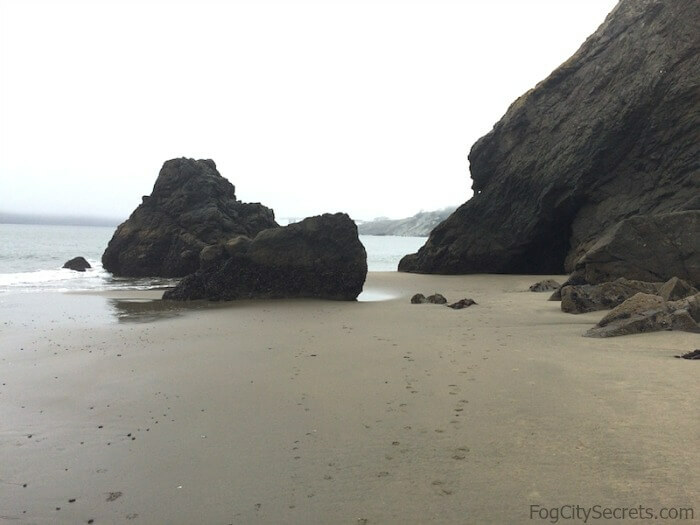 If you come at low tide, you can explore the area between China Beach and Baker Beach. 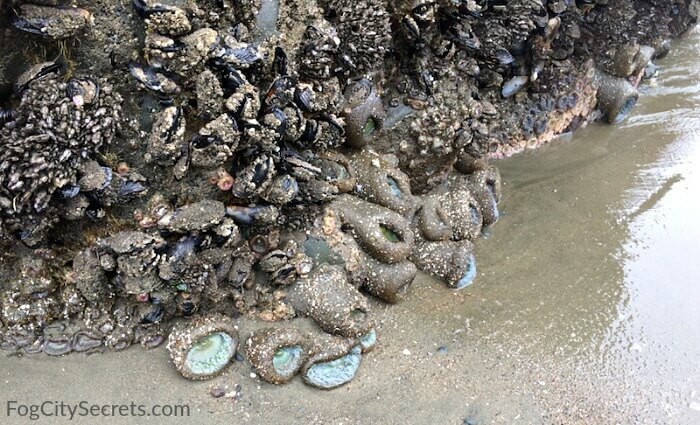 You'll find lots of mussels and sea anemones, and occasionally sea stars, clinging to the rocks. Check the tide chart before you go. 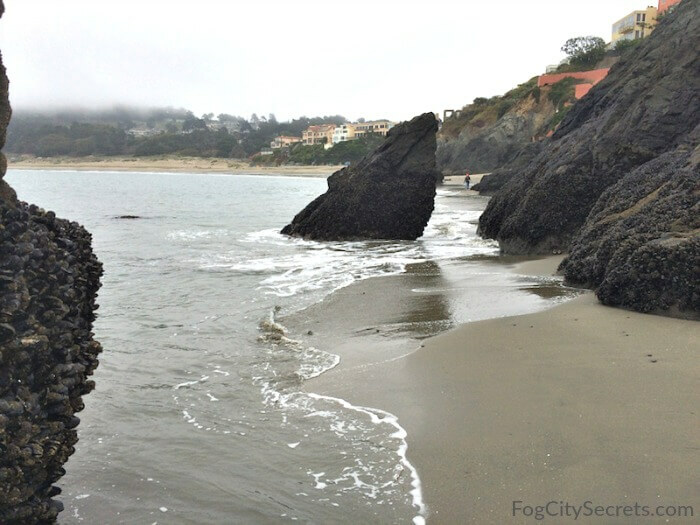 China Beach doesn't really have tide pools; the areas between the vertical rocks have sandy floors. The marine critters can be seen on the lower half of the rocks, which are submerged part of each day. The sea anemone you'll see on the rocks is the Aggregating Anemone (Anthopleura elegantissima)...an interesting fellow. It looks more like a plant, but is actually a predatory animal. They catch and eat other sea creatures like crabs and fish. This local sea anemone has a symbiotic relationship with a sea algae. The algae lives in its tentacles (hence the green color) and provides it with oxygen and an amino acid that acts as a sun screen for when it's above water. The anemone is also very territorial. 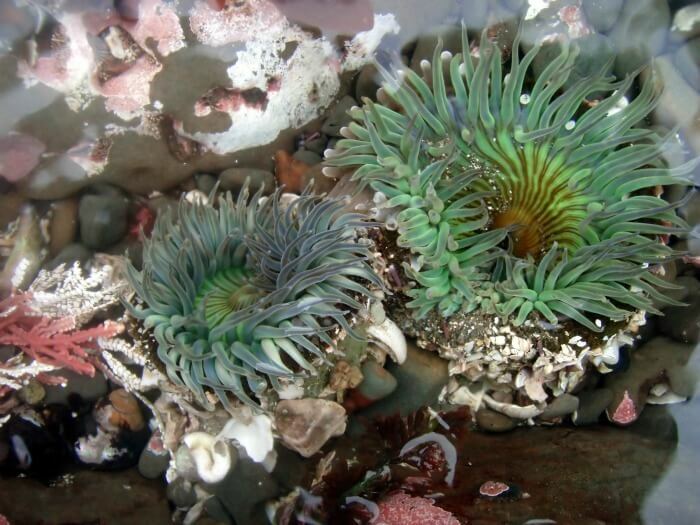 It clones itself to form colonies that are genetically identical, and if another anemone with slightly different DNA happens along, it will attack it with its tentacles. Surprisingly active given its inert appearance! How do we know they're fighting? By the white tips on some of the tentacles; they concentrate the venom there during their territorial battles. When they're out of the water, they don't look like much...a rather inert blob, more plant-like than animal. The pretty tentacles only come out when they're under water. Who would suspect all that drama going on under the water? Some of the best tide pools near San Francisco are in a marine reserve in Moss Beach, about 40 minutes south of SF on Highway 1. Their pools are extensive and full of all sorts of sea life. 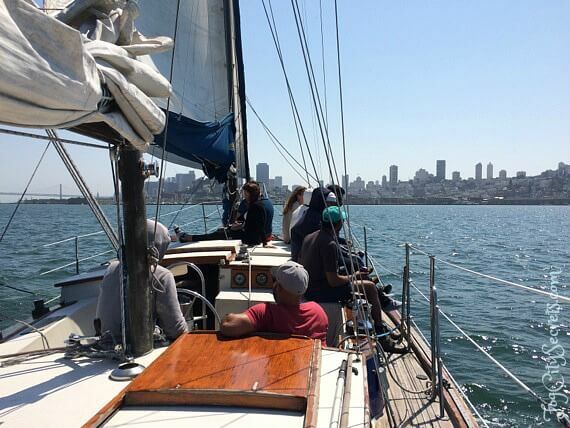 See the Fitzgerald Marine Reserve for more info. The beach changes pretty drastically each day, depending on the tide. There are two high tides and two low tides in roughly each 24 hour period. The variation can be up to 10 feet, or 3 meters, within 5 or 6 hours. See the current San Francisco tide chart. At high tide, the northern end of the beach ends at the first block of large rocks. 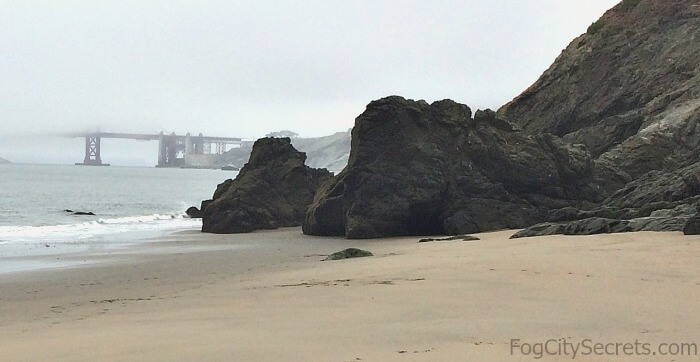 At low tide, you can walk all the way past the rocks and turn the corner to see Baker Beach on the other side. 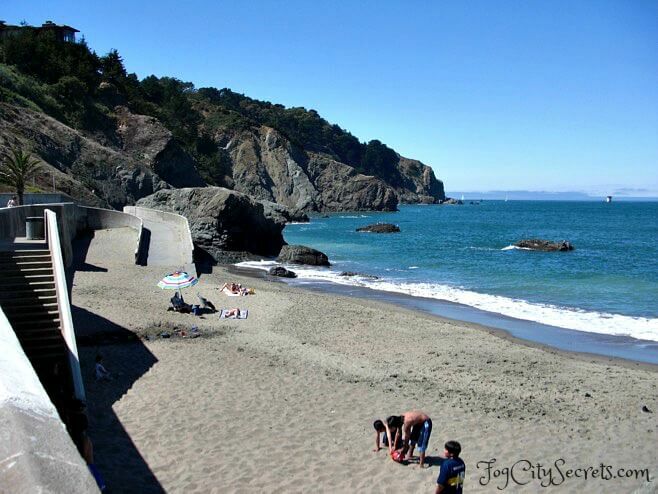 If the tide is really low, as in a negative tide, you can walk around the corner to Baker Beach from China Beach. But even with the lowest tides, it's a bit dicey walking around the corner; always keep a sharp eye for incoming waves. And don't stay too long at the other beach, or you'll have to take a very long walk the long way around. 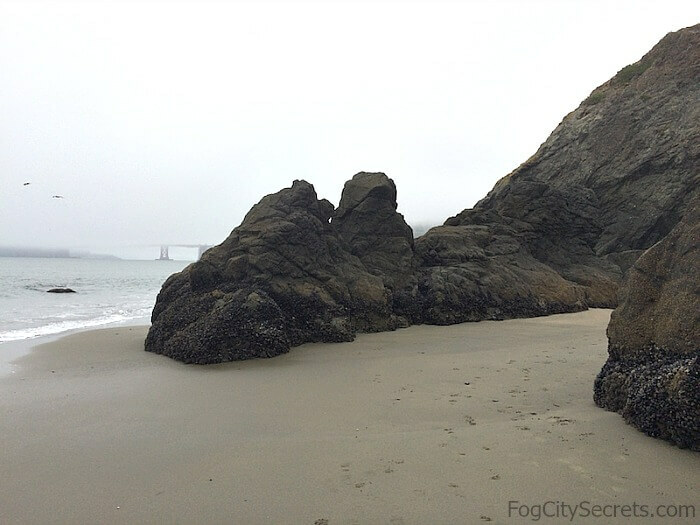 During a low tide, you can get around the first block of rocks to explore the area between China Beach and Baker Beach. There are a series of outcroppings of rock that reach into the water, and if it's a really low tide, you can get all the way around the rocks. 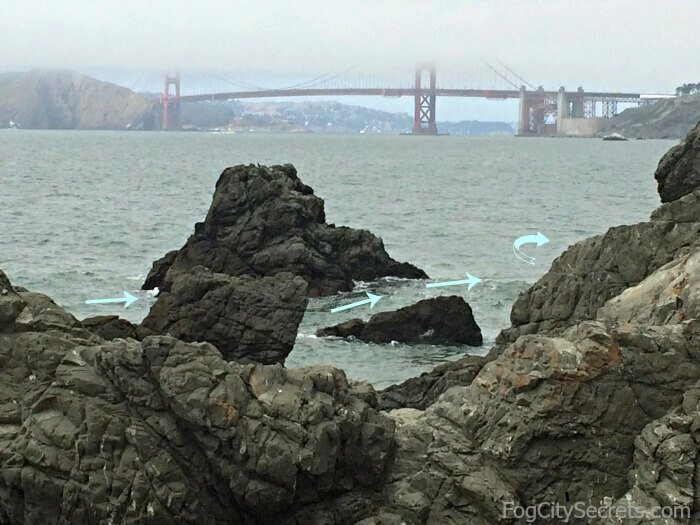 Plus, this is where you'll find the mussels and sea anemones on the lower parts of the rocks. Around the corner. Baker Beach in view. In the distance, someone is making the trip. As you can see, it's a bit risky. Important to watch for those bigger waves. Not for kids. 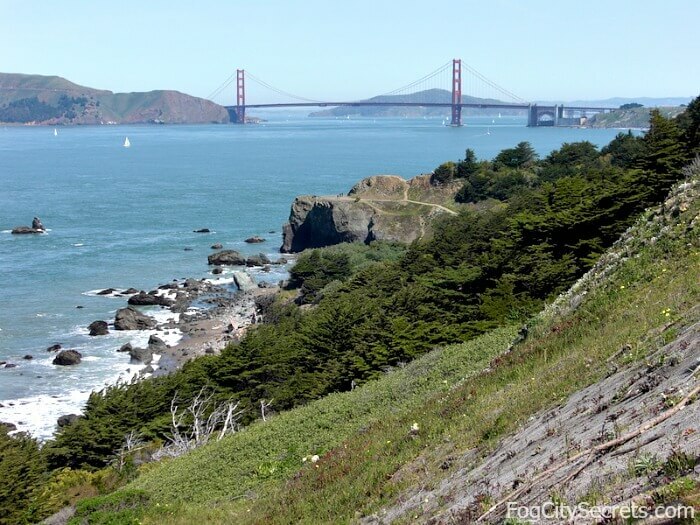 The neighborhood surrounding China Beach (Sea Cliff) is one of San Francisco's wealthiest. It's fun to walk around and take a look at the amazing real estate here. Head down Sea Cliff Avenue or El Camino del Mar for some serious rubber-necking! A number of well-known people live or have lived in this neighborhood, including Robin Williams, Sharon Stone, Ansel Adams, Jefferson Airplane guitarist, Paul Kantner, and the SEO of Salesforce, Marc Benioff (who recently reported seeing a mountain lion near his house, in his security camera footage). This is such a gorgeous stretch of coast. 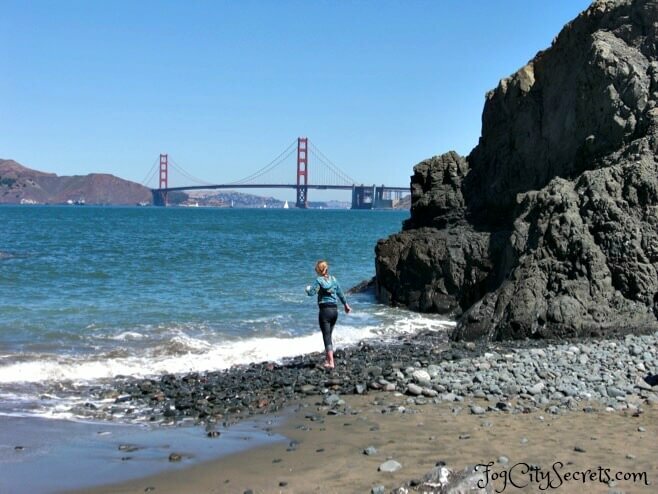 If you can, check out the trail through Lands End next door to China Beach. 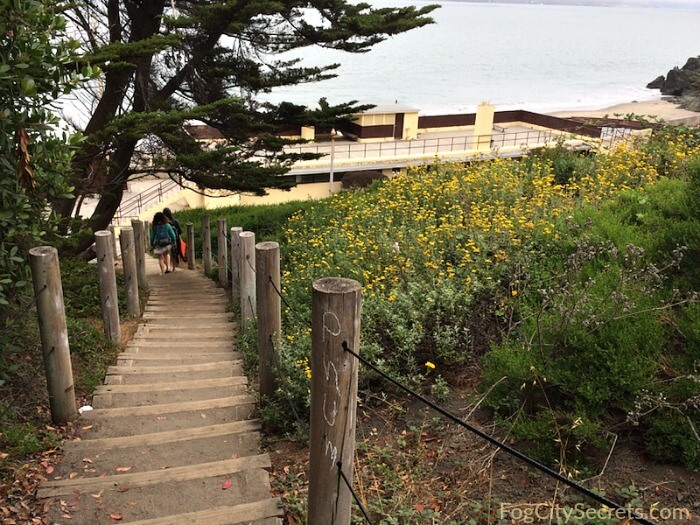 One of the prettiest walks in SF! By car, it's really easy. China Beach is at the southern (western?) end of Sea Cliff Avenue, in the Richmond District of San Francisco. Coming from the west on El Camino del Mar, there's a tiny brown sign that says "Public Beach" at the turn off; coming from the other direction, on Sea Cliff Avenue, there's no sign for the beach, just a Dead End sign. Sea Cliff Avenue dead ends at the parking lot for China Beach. The lot is usually not that crowded, unless it's a sunny, weekend day. If it's full, there is some street parking in the area. 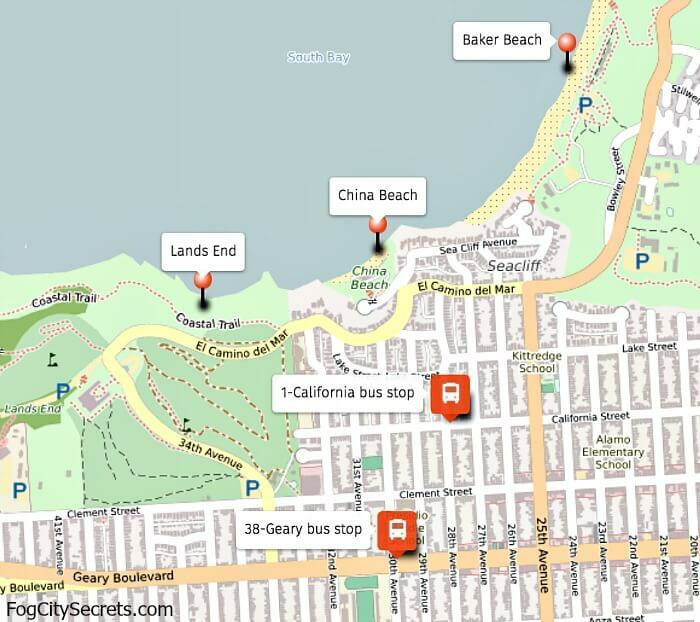 Using GPS to find China Beach: using one of the the local addresses seems to work better than "China Beach". Try 455 Sea Cliff Avenue. From Union Square: take the 38 Geary bus (at Geary and Stockton St.) all the way out Geary Blvd., get off at the 30th Avenue stop, then walk about four blocks on 30th, then right on El Camino and left on Sea Cliff. 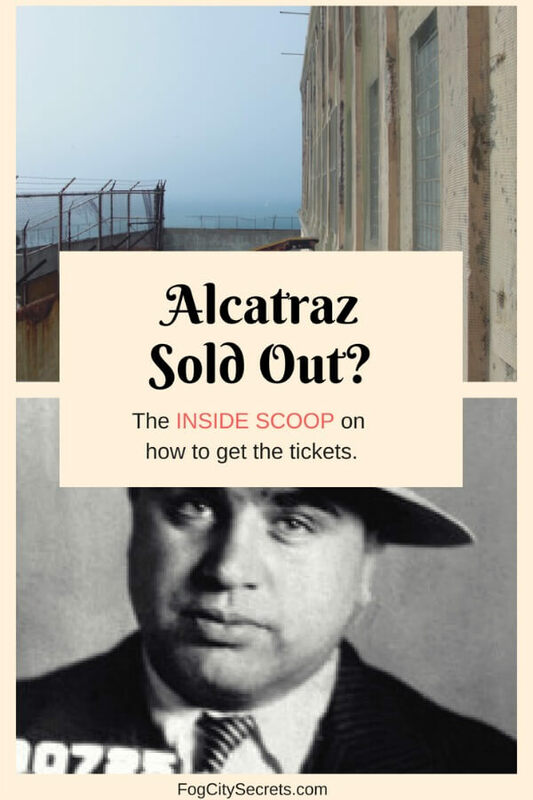 From downtown SF, take the 1 California to the California & 28th Ave stop, and walk down 28th two blocks, then left on El Camino and left on Sea Cliff. You can catch it on Sacramento St. at Davis, near the Embarcadero and Ferry Building, or along Sacramento as it goes through Chinatown. 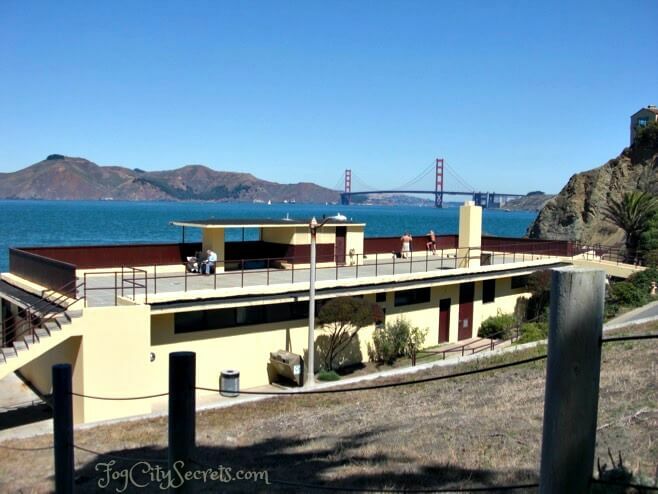 Check out the popular Baker Beach next door, with its great Golden Gate Bridge views and nice picnic area.